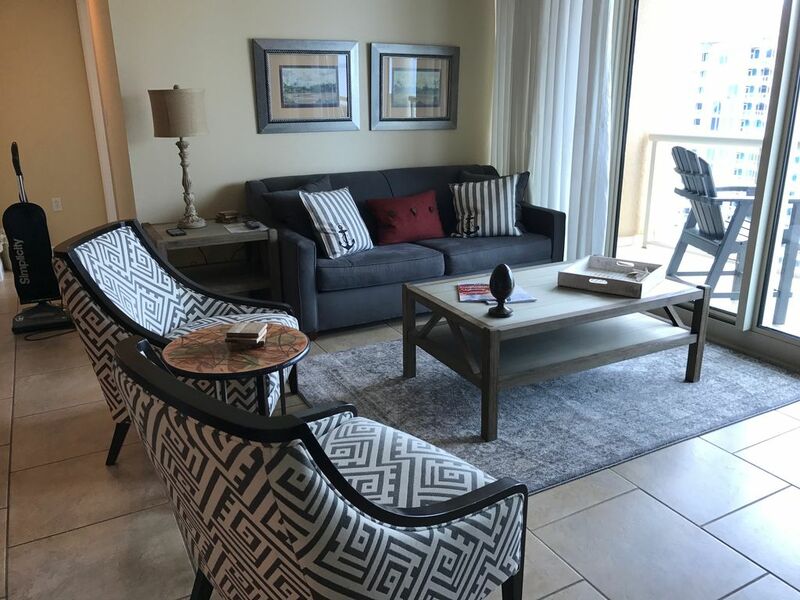 This Pensacola Beach condo rental is located at the Portofino Resort. Portofino is a luxury condominium resort (2004) that is located on the Gulf of Mexico at Pensacola Beach, Florida. Portofino offers many amenities such as a 40,000-square-foot, lifestyle center that includes state of the art fitness equipment including Cybex weight machines and True cardio equipment with individual LCD T/V. Personal trainers, Pilates, Spin Classes, Yoga Classes and water aerobics are also available. Spa with message therapy, body treatments, facials, As you work-out on the State-of-the-art equipment, you have a view of the two Infinity Pools and the spectacular Santa Rosa Sound. An indoor Olympic-size lap pool and four Rubico (clay) Tennis Courts are located on sight. If golf is on your agenda, a free water shuttle to the beautiful Tiger Point Championship Golf Course is available. For more information regarding the numerous amenities available click on the Portofino Resort website. Our condominium is located in Tower 1 on the 19th floor. It has 1335 square feet and has been professionally decorated in the Jewell Tone collection by Resort Interiors. There are nine-foot ceilings throughout with designer window treatments and accessories. The entrance has an eight-foot-wide double door, opening onto ceramic tile flooring throughout the living area, kitchen, and baths. Free WI-FI accessible throughout condo. Kitchen- Oven, microwave, toaster, and coffee maker(with coffee), blender, double refrigerator, all utensils for gourmet kitchen. Breakfast Bar with 3 barstools. Living/Dining Room- Table & six chairs, 37' flat screen Sanyo HDTV with surround sound & cd player, Movies on Demand, Sleeper Sofa, 2 chairs, coffee table, ceiling to floor sliding doors. Master Bed Room- king size bed, two nightstands, armoire with 32' Sanyo Flat Screen HDTV with on Demand Movies and DVD, chair, separate his-n-her closets, nine-foot, sliding, glass door to balcony, berber carpeting, oversized walk-in shower, jacuzzi tub, his-n-her sinks, separate private toilet area. Guest Bedroom/Bath- two twin beds, nightstand, an armoire with 24' TV and DVD player. A glass door to balcony, berber carpeting, sink, toilet, shower /tub. Misc.-Full washer/dryer, Graco Pack-N-Play, wireless high speed internet connection, board games, puzzles, 4 beach towels for use, variety of books, six beach chairs. Balcony- Stainless electric grill, table and four chairs, spectacular bay/sound views and beautiful Florida sunsets. Powder Room- pedestal sink, toilet, mirror. Some comments from our guest book! We are a family of four. Dad is an airline pilot, mom is a school administrator, daughter is a Physician's Assistant and our son works for a commercial real estate firm. We love going to Pensacola Beach! There is also many things for the entire family. The incredible Beach, Fishing, Naval Air Museum, Great Restaurants, Excellent Wave Runner location and Tiger Point and Navy Golf Courses. The Portofino Resort offers many things such as; tennis, a world class workout facility overlooking the outdoor pools and the 'Sound'. Locker rooms with showers, Sauna and Steam rooms, beautiful infinity edge swimming pools, poolside restaurant/bar, indoor restaurant, Olympic size indoor lap pool, spa, gift shop and snack bar. It is also a great place to ride wave runners because you have direct access to the Sound from the Resort. There is also a water taxi to the boardwalk. Numerous water activities. Extensive Exercise facility Located in Portofino Lifestyle Center included with rental. Plus 3 barstools at the bar! 2 outdoor 'Infinity Edge' pools and 1 indoor Olympic length lap pool. Spa and Lifestyle Center that includes Massage Therapy, Body Treatments and Facials, Personal Trainers, Pilates, Spin Classes, Yoga Classes and Water Aerobics, Indoor Heated Pool, Restaurant, and Lounge, Hot Tub, Sauna and Pool, Phone, High Speed Internet, Full Kitchen including, Refrigerator/Ice Maker, Cooking Utensils, Linens, Full size Washer, Dryer and Jetted Tub in Master Bath, Covered Parking in Garage with one covered space. Unlimited outdoor parking. Comfortable and clean with beautiful view of the Santa Rosa Sound. We enjoyed our stay for the month of February 2019 at Portofino Tower 1. The condominium was very clean and comfortable. The kitchen was nicely equipped which met all of our needs. There are many nice restaurants minutes away in Gulf Breeze and Pensacola. We enjoyed the balcony and view of the Santa Rosa Sound. The Gulf Islands National Seashore Trail for walking and running was beautiful and close by along with the beach. There is a dog beach a couple minutes drive from the condominium or a short walk. This beautiful area is worth the visit. Everyone was very friendly and helpful. Weather wasn’t as nice as we had hoped for but overall it was nicer than our home area in western Pennsylvania. The condo was beautiful with amazing unobstructed views of the water. When you walk into the unit, the first thing you see is the water. The unit is stocked with beach equipment, coffee maker, dvd player, everything you need. The pictures really don't capture how nice the unit is. The master suite's bed is a soft mattress... Not my comfort zone but nothing to complain over! Great stay!! Needs more seating furniture in Living Room area. Master br mattress needs replacing sags in the middle. Master br TV would not work, no way to connect to Direct TV, Mike maintenance guy tried but could not get to work. We stayed in our condo immediately following the guest and replaced/upgraded the bedroom and living room TV’s. The king size Stearns & Foster mattress is 1 year old. We replaced the bed frame’s center support and had no further issues. We love the Stearns & Foster! The living area has a couch and 2 chairs. The adjacent dinning table seats 6 and the bar has 3 barstools. Great property with an excellent view. Great property and location. No major issues, great resort staff. Would highly recommend and would stay again. Wonderful condo with a great view of the sound. Very nice place, well equipped with all that you need for a fun vacation. They even had fun restaurant tips for us. The owners were very easy to deal with and charged a fair price. I would go back in a heartbeat. The property itself is beautiful and had a ton of amenities. Grab a deluxe or extreme deal before you go for better prices on the amentities. We are so happy that you enjoyed your stay. We try to make our condo a home away from home. Please come back any time. On site rentals for Biking, Kayaks, Sail Boats (Hobie Cats), Surf Boards, Boogie Boards, and Sea-Cycling, Water-taxi, 2 Beach Chairs and Umbrella. Add $59.00 damage protection policy through (Home Away/VRBO) or guest can also use the $250.00 deposit as a refundable damage deposit. (In this case the entire rental amount would be due 21 days in advance and the deposit refunded within 7 days).